Antique trays make great collectibles. They are one of the leading fields of antique advertising. Their appeal is two-fold. Most antique advertising trays are very affordable compared to their actual rarity level. A porcelain sign that is 1 of 500 known to exist might sell for $500. The same tray might only sell for $50. So trays appear to be a good bargain right now. The other thing that makes them appealing is their general attractiveness and the fact that trays are easily displayed. A collector could invest $5,000 and buy a couple dozen really nice high end trays and make a beautiful display in his or her home. Trays are also easy to ship. We are continually surprised at how cheap some trays still are. 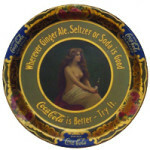 Antique Beer Trays: The most diverse offering of antique trays comes from the breweriana field. If a table ordered four beers in 1910 then the group of four beers was likely served on a tray that was then left at the table. Breweries had a lot of incentive to make colorful and interesting trays so that the next round might be one of their beers. There are hundreds of different types of beer trays known to exist today. Some people focus on trays from a certain geographic area or from one particular brewery. Most decent trays sell in the $50 to $200 range. The very rarest trays can still be worth more than $1,000. Tobacciana Trays: Some antique trays advertising tobacco products, usually cigars or cigarettes. The advertising isn’t quite as imaginative, but it is certainly still interesting. These trays don’t have the same following as beer trays; so while they are rare, the market just isn’t especially competitive. Political Trays: If you think there are too many political ads in today’s elections, just imagine that same advertising effort but without TV as the primary outlet. If it could be advertised on, then odds are that politicians found a way to use it to their advantage during elections. There are a few different political trays floating around out there today. Their specific purpose is anyone’s guess. Coca-Cola Trays: There is a very special market for anything Coca-Cola related. The same is true for their advertising trays. Coke trays have been researched and studied for decades. Believe it or not, some Coke trays can sell for more than $10,000! That is of course the exception to the rule, but any Coca-Cola tray is worth examining. In addition, there are many other trays related to early sodas and fountain drinks as well some popular ones include Hire’s Root Beer, and Moxie. There are other types of advertising trays out there. Our article here is just a very brief overview. We should also mention that while most antique trays are tin with lithographs on them. Other materials like wood and porcelain were used. However, the market has decided that tin trays with colorful vignettes are the preference of most collectors.